For sale is a CGC 9.2 Golden Record Reprint of Journey Into Mystery #83. This issue is the 1st appearance of Thor. Please let me know if you have any questions. Be sure to check out my other items for many more CGC graded key issues. 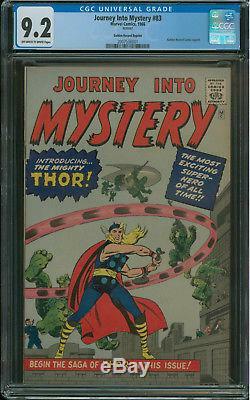 The item "Journey Into Mystery #83 CGC 9.2 Golden Records Reprint 1st appearance of Thor" is in sale since Friday, January 11, 2019. This item is in the category "Collectibles\Comics\Silver Age (1956-69)\Superhero\Thor".